100% natural ingredients for an irresistible meal. Cosma wet cat food is a great choice for responsible cat owners who want to feed their cats a top quality food. This wholesome, premium quality food is made using 100% natural ingredients and it is completely free from artificial preservatives, aromas and taste enhancers. The delicious recipes are just the thing for choosy cats. The carefully selected natural ingredients create an intensive taste experience. Cosma wet cat food is a pure delight for your cat. Cosma wet cat food is also suitable for cats with nutritional sensitivities or food allergies. This premium food is well accepted by cats and easy to digest. Choose from a range of different flavours and varieties of wet food. And if you want to give your cat a tasty snack between meals, try Cosma Snackies. These delectable morsels are the perfect treat for your feline friend. 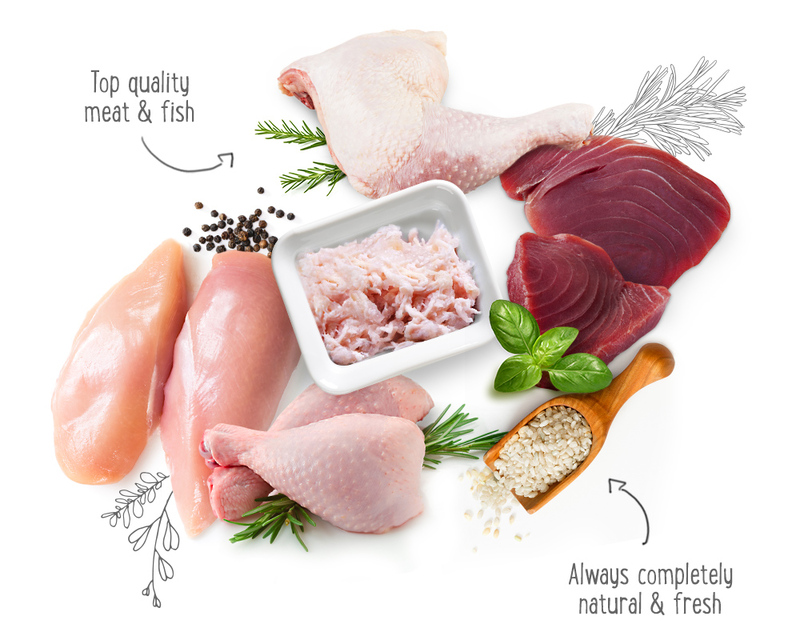 Pure ingredients for a natural cat food which is irresistible: Cosma makes it easy to feed your cat a species appropriate wet cat food because we only use 100% fresh meat and fish which is carefully prepared and used to create delicious recipes. Cosma wet cat food is made to the strict quality standards which also apply to the preparation of human food. And Cosma is made without artificial colours, flavour enhancers, attractants and preservatives. It does not contain formed meat or slaughter by-products. All ingredients used in Cosma cat food are completely natural and of the best quality. 100% natural products for a very special taste ensure that this food is well accepted, even by the choosiest cat. It is also suitable for cats with nutritional allergies or sensitive digestions. Cosma provides your cat with the very best quality and you will know that you are feeding your cat in a responsible and healthy way. Treat your cat with Cosma premium cat food. Each variety contains only pure ingredients which are prepared using only stock and vegetable based pectin so that it retains the undiluted taste of carefully selected ingredients. These tender pieces of meat or fish in a light jelly or its own juice make your cat's mealtimes into a very special, juicy delight your cat will not be able to resist. It has an appealing smell and an even better taste. All Cosma wet cat food also contains important vitamins, minerals and taurine. Why not try the entire range from Cosma Original in juicy jelly and Cosma Nature in its own juice, to Cosma Thai with exotic rice. And for the cat with discerning tastes we recommend Cosma Glory with its extremely tasty, very sophisticated recipes. And as a very special treat you can also treat your cat with delicious Cosma Snackies, a premium cat snack made from 100% pure meat or fish. Cats simply adore these tasty little snacks and the top quality guarantees that even the fussiest cat will enjoy them. Cosma Snackies are completely natural and grain-free. They are made using a very gentle and lengthy freeze-drying process which ensures that all the vital nutrients and great taste are retained. The meat or fish is carefully heated at an extremely low temperature to slowly extract the water. The high quality of preparation which goes into Cosma Snackies means that your cat will have an intense taste experience. The little treats are made using only carefully selected fish or meat which is of a standard suitable for human consumption. Cosma Snackies are the pure, natural snack you’re your cat and available in the varieties chicken, duck, beef and tuna. Cosma cat food and snacks provides your cat with a delicious selection of meals and little treats. The Cosma range includes Cosma Original, Cosma Thai, Cosma Nature and Cosma Glory wet cat foods, and Cosma Snackies cat snacks. All products are available in different sizes, so there is something for everyone.